Located on the second floor of a prewar Emery Roth co-operative, this sun-flooded spectacular southeast corner two bedroom residence has been completely renovated with the highest level of finishes used throughout. This luxurious home has picturesque tree-lined views over Park Avenue and south overlooking St. Ignatius Loyola church. There are ceilings up to 11 feet, rift and quarter-sawn oak herringbone floors, new oversized soundproof windows, central air conditioning, new European radiators, a Lutron lighting system with LED art lights, Lutron electronic solar shades in all rooms, custom millwork, Zuccetti and Vola fixtures, and Donald Kaufman paint colors. One enters into an impressive entrance gallery that has a walk-in coat closet and exquisite floor-to-ceiling glass and steel sliding doors that allow for separation between the entertainment spaces and the private quarters. Off the gallery is a grand living and dining room that is 26'6" by 19'6" with three huge windows facing east overlooking the beautiful trees on Park Avenue. The stunning room has a wood burning fireplace that is Moleanos honed limestone, and there are custom Afrormosia hardwood bookshelves and sliding panels which conceal a television. There is a windowed kitchen that faces south overlooking the church. It has been meticulously renovated and has Bulthaup kitchen cabinets, Imperial Danby honed marble countertops and a clear glass backsplash. It is equipped with top-of-the-line appliances including a Subzero refrigerator/freezer, a Perlick Signature Series wine refrigerator, a Miele Futura dishwasher, a BlueStar 36-inch six burner range, oven and vented hood, and a water filtration system. In the kitchen is a laundry closet with a vented Asko washer/dryer as well as a utility closet. 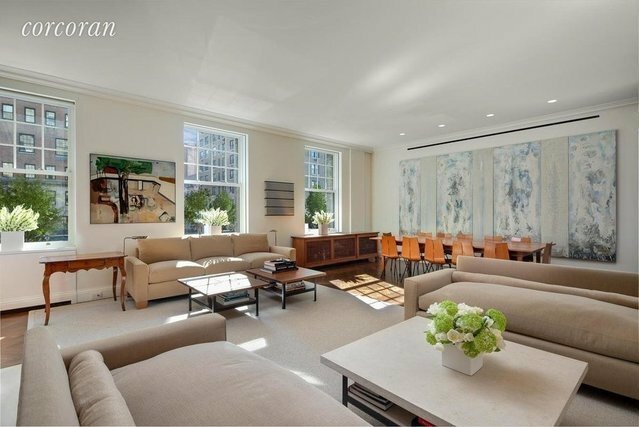 In the corner is the sun-drenched master suite with three large windows that faces south and east with views over Park Avenue and the church. There is a large walk-in dressing room with custom built-ins and a lavish en-suite renovated windowed master bathroom that faces south. The bathroom is finished with Imperial Danby honed marble countertops and Glacier glass tiles on the floors and walls; it has two sinks and an enormous walk-in shower with two rain-head showers. There is a second bedroom suite that faces east over Park Avenue and a renovated hallway bathroom with a walk-in shower with Glacier glass mosaic tiles and Avorio honed limestone counters. This home is a true architectural masterpiece. The building allows 50% financing and there is a 2% flip tax. Built in 1916, this white-glove prewar co-operative has a fitness center and bicycle room.